Ira Lindsey was born 27 June 1790 in Monmouth, Androscoggin County, Maine and died 3 April 1844 in Del Rey, Iroquois County, Illinois. He first married Joannah Merrill about 1812, probably in Turner, Androscoggin County, Maine. They divorced, and he later married Maria Ayres 13 January 1832 in Mason County, Virginia. Records indicate that Ira served as a private in the War of 1812 in Capt. D. Lindsey's Co., Lieut. Col. W.R. Blaisdell's Regiment from September 13 to September 26, 1814. Called out by the Governor of Massachusetts to suppress a threatened invasion, the company was raised at Leeds, Maine and awaited orders in camp at Gardiner. It was on September 14, 1814, after witnessing the British bombardment of Fort McHenry in Baltimore, Maryland that Francis Scott Key wrote "The Star-Spangled Banner". It is likely that Ira married Joannah Merrill of Turner, Maine about 1812. The couple had three children, all born in Leeds, Maine: Sylvia (b. 27 March 1813), Levi (b. 21 September 1816) and a male infant whose name is not recorded (b. 18 May 1818). The infant died 1 July 1818. It is sometime after 1818 that Ira and Joannah separated. Joannah married again to Aaron Soule, a Captain in the War of 1812 and Mayflower descendant, and bore at least three more children --- all daughters. She remained a Maine resident and is buried alongside her second husband in the Merrill family plot in Turner, Maine. Ira and his brother, Roland Bailey Lindsey, traveled west. Ira's desire to travel may've been a factor in his divorce. The two brothers appear in 1821 Mason County, Virginia land records. Ira purchased 1,244 acres near the Kankakee River from the E. Thomas Land Company. Roland purchased 1,112 acres. While Roland appears on Mason County, Virginia census records for the years 1820 and 1830, Ira does not. However, two males aged 30-40 reside in Roland's household. The second male is probably Ira. There is family speculation that the two brothers passed through Chautauqua County, New York just prior to their arrival in Mason County, Virginia, as both brothers went on to marry ladies from this area. Chautauqua County is located at the west end of New York state and contains the headwaters of river that flows to the Ohio River. Mason County is located on the opposite bank. In 1832, Ira married Maria Ayres in Mason County. The Ayres family also settled the county in 1821, purchasing 2,758 acres of land, also near the Kankakee River. Because Ira was significantly older than his second wife (by twenty years) and Maria's father had passed away a few years prior, their marriage is believed to be one of convenience. In 1833, they bore their first child, appropriately named - Virginia. The Lindsey's worked the land for a couple more years after their marriage in 1832. Ira then began selling his land to his brother Roland and brother-in-law, Samuel Mason Ayres. Deeds documented his new residence as Illinois. According to family rumor, the Virginia land was bad. Nevertheless, 154 acres of Virginia land remained in Ira's possession until 1845 - one year after his death. It was eventually seized by the Commonwealth of Virginia for non-payment of taxes between 1840 and 1844. "Ira Lindsey, Jonas Smith (James, his son) and J.B. Grice left West Virginia September 10, 1834 and by wagons arrived at Perrysville, Indiana in 15 days where Lindsey's family stopped with Abram Lehigh, an old acquaintance … [Lehigh left the same place in Virginia a few years before and concluded to accompany his friends in search of a new home.] The men made an extensive trip into Illinois to select land … Lindsey made his claim on the S.E. ¼ section of Sec. 36, T. 26, R. 10 E. [and Lehigh made his claim.] Lindsey and Lehigh at once built cabins for their families … These preparations being made, they returned for their families and November 4, 1834, Lindsey moved into his new home …"
"Ira Lindsey had considerable means and entered a number of choice tracts of timber which he sold to those who came in the after years … In the Spring of 1837 or 1838, a fruit peddler appeared on Upper Spring Creek. Lindsey [et al.] bought out his entire lot and set their orchards." In 1843, Ira built a brick house and a large frame barn. After the Lindsey's moved into their new brick home, Mrs. Lindsey taught school in their old cabin. Other than the log cabins on the creek, the brick house was the first in the area. "[Ira] was justice of the peace and officiated at the wedding of R.B. Panghorn and Margaret Harper. This was the first effort in that direction, and he was more frightened than they. After this, he was called upon for similar official acts. He was the first grand juror from the precinct; in May 1836, he paid $9 into a county treasury, fines he had collected. He was one of the jury that tried Joseph Thomason for murder and hung the jury three days, the evidence being circumstantial. He was one of the leading men in the settlement." Ira revised his last will and testament 25 March 1844, one week prior to his death. He appointed his brother-in-law, Samuel Mason Ayres, as executor and heired all property to his wife, with the exception of a portion of land, one horse named Steve, and one yak of three years that was willed to his nephew, Thomas Lindsey, son of Roland. Mrs. Lindsey was to dispose of property as she deemed necessary for the maintenance and education of their four infant children (Virginia F., James S., Benjamin F. and Adaline A.). Ira willed that the land be equally divided amongst the four said children once of age and between Levi and Sylvia (Lindsey) Pollard - Ira's two legal heirs from his previous marriage. Ira is buried in Del Rey Cemetery in Del Rey, Illinois and shares a monument with his wife. 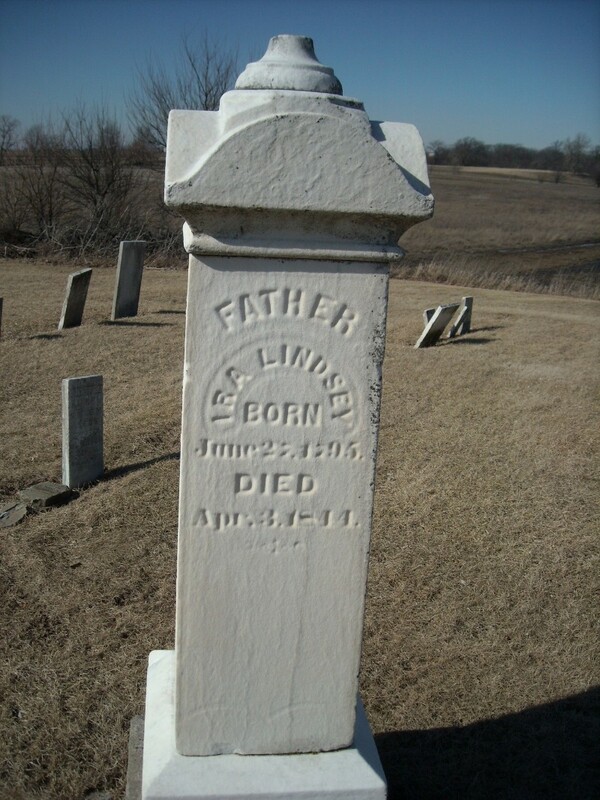 It reads, "Father, Ira Lindsey, born June 27, 1795, died April 3, 1844." The birth year has been proven incorrect. • He served in the military during the War of 1812 in Leeds, Androscoggin County, Maine. • He worked as a Justice of the Peace in Del Rey, Iroquois County, Illinois. • He owned property from 1821 to beyond his death in Mason County, Virginia. • He appeared on the census in 1840 in Iroquois County, Illinois. • He was buried at Del Rey Cemetery in Del Rey, Iroquois County, Illinois.